The past decade has witnessed a revolution in carbon science. Since the discovery of carbon nanotubes in 1991, the field has exploded in magnitude by attracting researchers from disparate fields around the world. 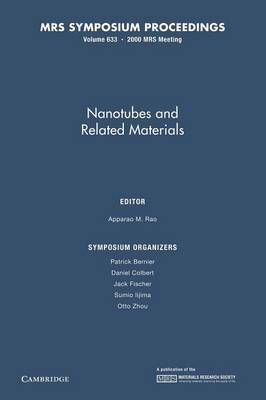 Fundamental scientific advances and applications are rapidly emerging due in large part to the unique physical, chemical, mechanical, optical and electrical properties of these nanotubes. This book, the third in a series from MRS on carbon nanotubes, focuses on current breakthroughs in carbon nanotube synthesis, electronic properties, processing and purification, optical and electrical characterization, mechanical properties, and chemical modification. Papers devoted to potential applications for carbon nanotubes in composites, nanosensors and nanoprobes, display devices, and as the storage medium for hydrogen are also included.